That’s not something that ever would entered the confines of my (conscious) mind. Running was something I never could have imagined “loving” all those years ago as a horribly uncoordinated grade school girl. Even back then, it was obvious who would be the future star athletes on the hometown football field or basketball court. The gym teachers knew who those future athletes were as well, and weren’t the least bit subtle in coaching them a little bit more (and shunning the rest of us). Fast forward to adulthood. I had all but given up on pursuing any kind of athletic endeavor, other than a few near-failed attempts at running an occasional 5K. Even though I didn’t consider myself a runner, I still had a feeling, deep down inside of me, that I had potential. In 2005, I got the idea to do one last attempt at running an entire 5K (with no walking!). Our town had a 5K event happening in about two months, and I decided to go for it. I started out running a simple mile on the treadmill, three times a week. When that go to be easy, I increased the distance to 1.5 miles, then 2 miles…until I was able to run an entire three miles without stopping. All went well and I was able to run the entire 5K on race day, and finished faster than I anticipated. Fast forward to a few years later,,,, and I conquered the half marathon distance. Several times. ALL was well in my little comfort zone. 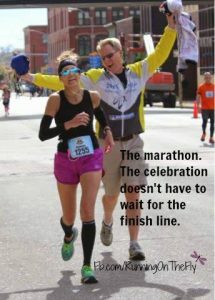 That was until I started blogging and debuted my running page, Running on the Fly, on Facebook. I met a lot of other runners embarking on their first marathons…and, wouldn’t you know it? 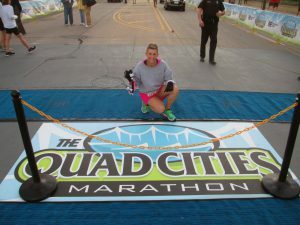 I jumped on the 26.2 wagon and registered for the Quad Cities Marathon. September 22, 2013 is a day I will never forget. I was truly blessed with a fabulous race day experience for my first marathon. Little did I know, that was just the beginning. I did a second marathon (IMT Des Moines Marathon, October 2014). Shortly after that finish line, I registered for my third (Grandma’s Marathon, June 2015). Then, some of these same friends talked me into taking on the challenge of doing an Ultra. Apparently, I’m an easy sell, because I registered for the Christmas in July 6-hour Ultra, happening a mere four weeks following Grandma’s (in July 2015). Actually, the Christmas in July event happened at a near-perfect time. I had experienced some Plantar Fasciitis a few weeks prior to Grandma’s, which caused me to re-evaluate my race day goals and priorities. As much as I needed rest and time off my feet, I still wanted to run Grandma’s. My solution? Treat Grandma’s as a long training run, and allow myself any walk breaks as needed…all in preparation for the Ultra. Problem s olved. Consequently, the CIJ Ultra was an overnight event, starting at midnight for the 6-hour runners. There were other events as well, beginning at various times, for other distances (5K, 10K, 12-hour Ultra, and 24-hour Ultra). The course was an approximate 1-mile loop on a trail around a lake, which was a perfect set-up for my in-question-recovering body being able to go that kind of distance (my goal was to complete a 50K within the 6-hour time limit). Due to the unique course logistics, I would have an opportunity to take a break at the completion of each lap without having to worry about continuing on a long point-to-point course, and all of my friends would be no further than a half mile (in either direction) from me. Now, keep in mind this was mid-July. The event started at midnight. Also, I had a goal of running the furthest I’ve ever run. If you do the math, that’s three strikes against me before I even crossed the start line. I should also mention the weather was very hot and humid (it was the hottest day on record for the year at that time for Lisle, IL). Oh, and there was lightning and rain for a couple hours that started about an hour or so after we’d started running. Fun times, right? Ironically, it really was a fun time. There were seven gals in our “group.” Some of these gals I had known for a couple years (via social media), and a couple of them were new acquaintances. Spending six hours together, running constant laps around the same course, allowed for a lot of getting-to-know-each-other time. There was constant chatter, a lot of laughter, several hugs, some tears, and a great deal of frustration with the weather. But, we all crossed the finish line as winners. None of us reached our goal of completing a 50K, but most of us conquered our longest distances ever. And the clincher? Several of us returned the following year (July 2016) and took on the challenge of the 12-hour Ultra! Yes, that was an entire different kind of crazy. 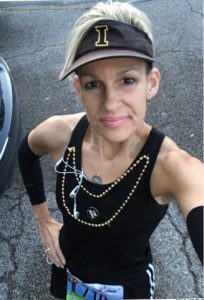 So, what made me “go Ultra?” Plain and simple, I was intrigued with running further than what (most) others would not even attempt. Sure, the 26.2 miles of the marathon is a beast in itself, but that distance has been done many times by a lot of runners. For many, the marathon is the ultimate conquest (it’s been said that less than 1% of the population will ever finish a marathon). Add in the element of running further that those 26.2 miles and the percentage diminishes even more. THAT, my friends, is what intrigued me!